This species includes T. argentea. This small tree is easily recognised by the corky bark and the grey, leathery leaves, which have 5-7 leaflets radiating out from a central point like spokes on a wheel, and these are silvery on the lower surface. 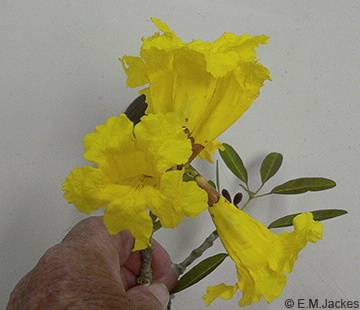 The yellow, tubular flowers form dense clusters towards the ends of the branches. Capsules to about 9 cm long and often about 2.5 cm wide, glabrous.